I would like to complete a marathon in 50 states. So far I have done 31. 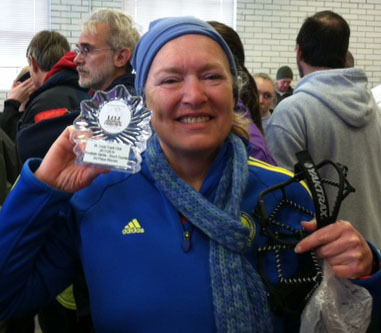 I want to bring more people like me (middle-aged and not an elite athlete) into running so they can discover how fun it is and how great it makes you feel to be active. Another goal I have is to see my chiropractor if need be, but to NOT need to see a cardiologist! I run because I can remember how bad it felt when I was not healthy enough to run. Since I lost weight and got healthy, I never ever want to go back to the way I used to feel! My best marathon memory began in 2009 when I ran Boston for The American Liver Foundation (ALF). I had raised a lot of money for ALF, and that put me on their mailing list for ever. Recently, in 2014, ALF invited me to attend a webinar about liver disease. I attended because I always like to learn about health topics. Just about a month later, my mother collapsed and had to be hospitalized. Her doctor told me her condition was hopeless and she would need permanent nursing home care. I remembered the information from the ALF webinar, and it seemed to me that her symptoms matched one of the conditions they had described. The doctor agreed to run further tests. As it turned out, IT WAS THAT CONDITION! My mother was successfully treated, and is now home from the hospital and as healthy as she was before. I have run a lot of marathons, both with and without pacers, and have found that being a part of a positive, fun pace group can make all the difference between having an enjoyable race and feeling that each and every mile was an endless, grueling effort. I want to be the pacer that gets to know people and builds a fun group so everyone has a great time and wants to come back and do it all again next race! I was in a pace group where we all got to know one another when we were waiting in the start corral. As we ran different people ran together, talked, and split up to run with each other in a fluid and relaxed way. Various people would run ahead, make a pit stop, and then catch up, so people came and went. But because the pacer kept a steady pace, we all finished together in the end, and took a great group photo. You should run with me if you want to have a great time and want to run at a reasonable, easy pace to really enjoy your race, and still finish at your planned time goal. Being social, talking to people, and having fun really helps a lot, especially when you get to those later miles when you start to wonder where the finish line is. Remember that by doing this race at all, you are already a winner. If the weather report says rain or cold weather later, bring a jacket to tie around your waist. If the race will start cold, and get hot, wear a throw-away old sweater or jacket and pants at the race start, and toss them when you get too warm. You can get them cheaply at your neighborhood Goodwill or thrift store. Wear a hat, sunscreen, and bring sunglasses. Eat and drink during the race, but don’t eat or dring anything new that you haven’t tried during training runs. First aid stations give out free bandaids, ice, and vaseline, and you don’t get in trouble if you stop at one for a few minutes to get your blister or sore muscle checked out! Don’t worry, be happy, and have fun! I just love to keep things positive, happy and upbeat for my whole pace group. I do not want to be the pacer who finishes the race perfectly on time, but alone! I have been known to run while wearing a tutu and a tiara, and carrying a kazoo. Although I am serious about running and keeping to the stated pace, I believe in running lightheartedly. I am a Mentor and participant for Team in Training. 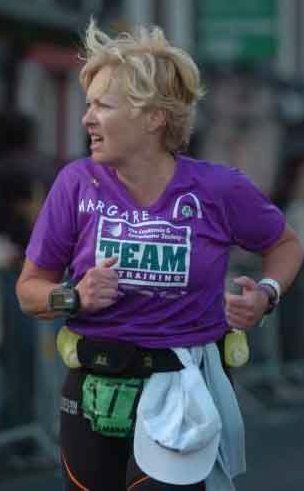 I have done 20 events and raised over $100,000 for The Leukemia and Lymphoma Society charity in connection with my running. I am proud to have been named one of the St. Louis Gateway Chapter’s Top 5 Fundraisers for 2013, 2012, and 2011. I also ran the Boston Marathon for American Liver Foundation in 2009. I ran a Team in Training race in May, 2014.